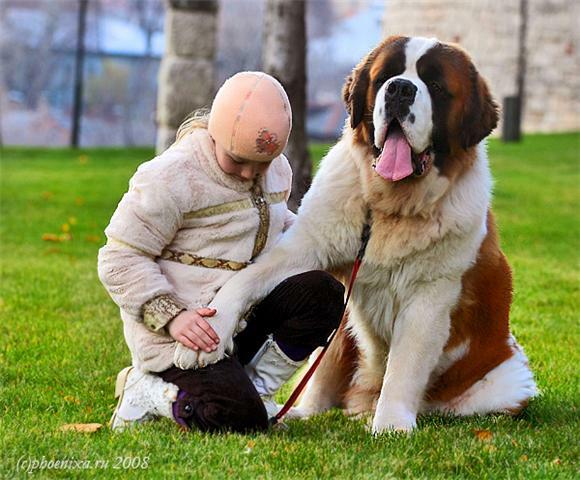 Benbaron's Iota By Adam was my very first St Bernard. I acquired her from Benbaron's Saints when she was 11 months of age. I was planning on getting a nice rough male puppy just for a pet but after being on the waiting list for over a year I was excited to learn when Iota became available. The breeder's told me she was to nice to go as "just a pet " and that I could only have her if I was willing to co-own and raise and half a litter with them. I thought no big deal and agreed. Little did I know this was the start of much more to come!! Iota was bred to the young Sky Meadows The Iceman which was both their first litters. Iota whelped 12 puppies March 17/97, 10 live, 5 boys and 5 girls! There was only one rough male in that litter which I had to keep! He become Am Ch Benbaron's Knight O'Iceman,WPS,CD. I also kept a very nice smooth female Benbaron's Kootenay O'Iceman. 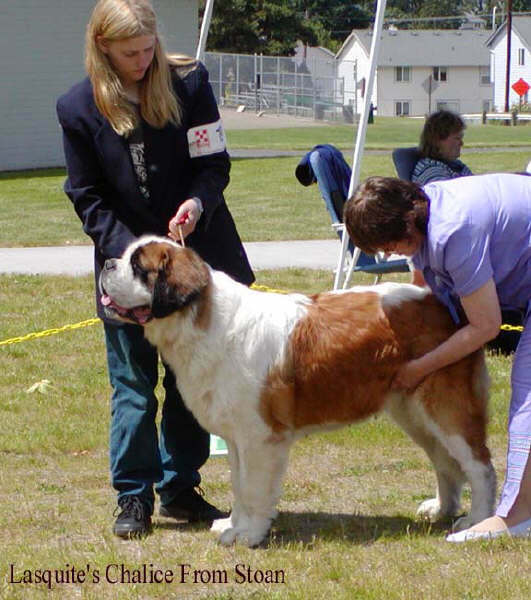 Am Ch Benbaron's Knight O'Iceman at 2 years of age. In the mean time Kootenay (Knight's sister I kept) Had a nice litter sired by Am/Aust Ch Stoan's Valiant Bart Of Mica. 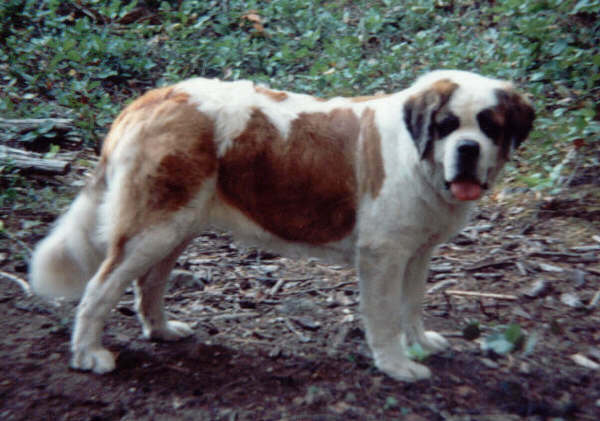 I had also acquired a nice smooth female puppy from Stoan's Saint bernards, Stoan's Nelda Of Nelba which I also co-owned with the Zielinski's. After bring Nelda down to Seattle 3 times to be bred with no luck we decided to breed Nelda to Knight. This was a success and produced 4 nice puppies in 2000, 1 boy and 3 girls. I kept one of the girls a very nice rough Lasquite's Chalice from Stoan. 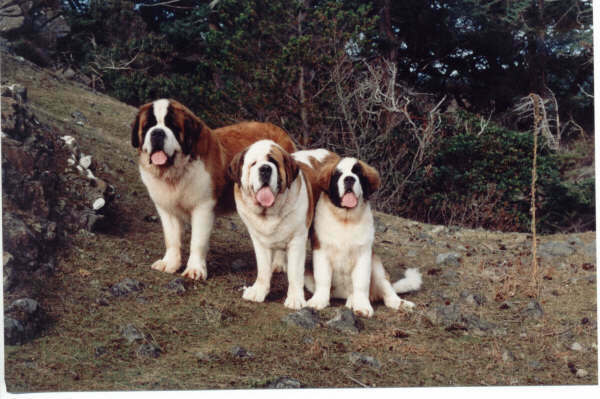 Left is Knight, center Nelda and right is Chalice at 5 months of age. In the meantime I traded Knight to New Sage Saint Bernards for one of her nice young males New Sage Desert Mist. Carolyn completed Knight's Championship, CD obedience title and Weight Pullers Superior title! I was able to complete Mister Championship and he sired 3 very nice litter here. Once of those litters was with Chalice. Mister & Chalice had 13 live puppies!!! I kept three of those puppies, Am Ch Lasquite's Garland v Chalice, Lasquite's Genvieuve v Chalice & Lasquite's Geena Mist. Lasquite's Geena Mist. Meanwhile I acquired a nice Knight son from New Sage Saints. New Sage Handsome K Lasquite. When Handsome and Geena were old enough I bred them together. In this litter was born Am Ch Lasquite's Orlando v Hans! 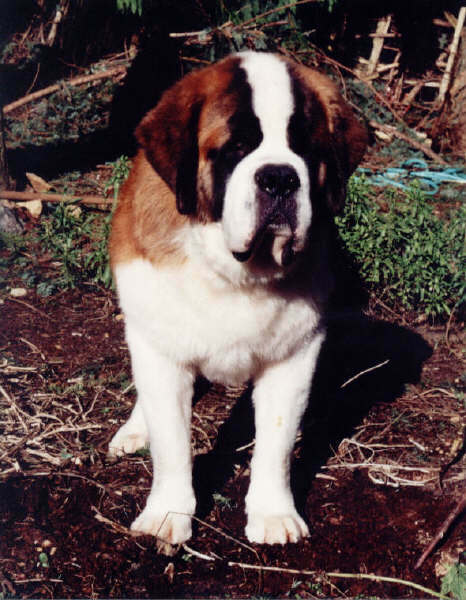 This breeding was repeated again for another nice litter of 13 puppies, I kept two from this 2nd litter Lasquite's Verde v Hans & Lasquite's Valdez v Hans, a litter sister also went to Stoan saints Am Ch Lasquite's Veronica C Stoan. 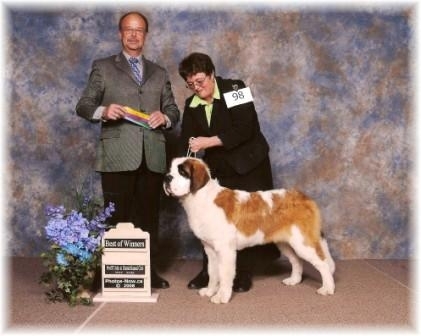 Am Ch Lasquite's Orlando v Hans, he has done great in the show ring including going Best Of Winners at the SBCA National 2006 and being in the top 10 Saint in the US. He is a great sire here with many find litters and champions to his credit. Below is a few of Orlando's fine puppies!!!!!!! !